The Pink Flame Rose is a wonderfully round shaped mid pink rose with a slight bi-colour of pale pink to the under petals. Pink Flame Roses are medium to large in size, have a long vase life, strong stems, deep green glossy foliage and are reliable to work with - a fantastic wedding rose. Pink Flame Roses are wholesaled in wraps of 20 stems. Stem lengths range between 60 and 80cm tall depending on the grade chosen. 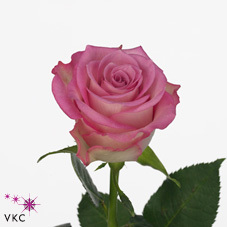 If you are looking for a lovely mid pink rose, Pink Flame roses are an extremely good choice!